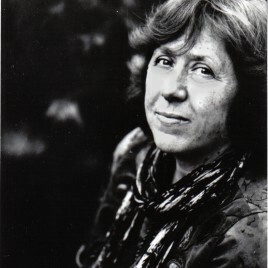 (born 1948) – a writer and journalist. She says that her own national identity is complicated (varying between Russian, Ukrainian and Byelorussian one), but she identifies mainly with Belarus. In her prose, she often stresses the need for democratisation and modernisation of Belarus (for this reason, her works are banned in this country), although her attitude to Lukashenka's regime is sometimes ambivalent. The author of many reportage books, including Voices from Chernobyl: The Oral History of a Nuclear Disaster, where she describes the Chernobyl disaster from the perspective of those who saw it in their own eyes; War’s Unwomanly Face – a harshly sincere story of Soviet chauvinism hidden under the guise of false emancipation; Second-hand Time – a history of economic and social transformations that followed the collapse of the Soviet Union.